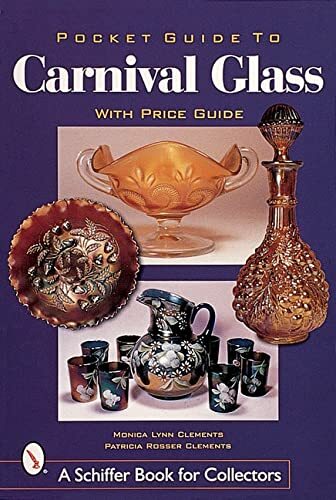 This attractive pocket guide presents the story of Carnival Glass, with a chapter giving an overview of how Carnival Glass has endured. Included are brief histories of Dugan, Fenton, Imperial, Millersburg, and Northwood. Over 200 beautiful color photographs will teach you how to identify classic Carnival Glass patterns as well as contemporary Carnival Glass pieces, along with the values you can expect to see in today's marketplace. For anyone who enjoys the beauty of the classic patterns or for those who appreciate the timeless appeal of more recent iridised glass, this book is a must. Monica Lynn Clements, a teacher and writer, and her mother, Patricia, are both antiques dealers. They have published several other notable books for Schiffer publishing, including *Pocket Guide to Pink Depression Era Glass, *Cobalt Blue Glass, *Sarah Coventry Jewelry, and *Pocket Guide to Occupied Japan.